Property 2: Hillside Anchorage Home by Hiking & Biking Trails! Property 4: Downtown Suite #2, Free WiFi and Laundry! Property 10: Perfect location with easy access to downtown and all your Alaskan adventures! Property 19: Have an Authentic Log Cabin Alaskan 5 Star experience at "The Eagles Nest"
Rooftop BBQ Deck, Views, Newly Renovated! Property 23: Rooftop BBQ Deck, Views, Newly Renovated! Property 36: Charming condo w/ a full kitchen & free WiFi right in the heart of Anchorage! NEW! 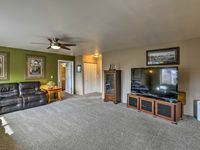 Anchorage Condo w/Fireplace - 1.6 Mi. to UAA! Property 41: NEW! 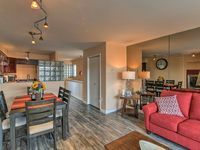 Anchorage Condo w/Fireplace - 1.6 Mi. to UAA! Property 42: NEW! Anchorage Apartment Near Midtown & Downtown! Lovely 2 bedroom duplex unit near the airport! Property 45: Lovely 2 bedroom duplex unit near the airport! Property 46: Cozy downtown retreat in tastefully updated 1950's log home - Clean & Quiet!